Class 37s will again operate locomotive-hauled trains between Norwich and Great Yarmouth on summer Saturday services. This is likely to be the last time locomotive-hauled coaching stock (LHCS) operates additional summer trains on the branch, with Stadler bi-mode units due to be delivered from later this year. 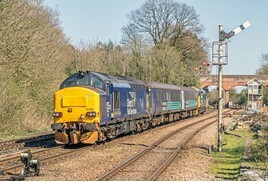 As per weekdays, top-and-tailed Direct Rail Services Class 37s will be used. The trains are booked to leave Norwich at 0955, 1120, 1318 and 1518, returning from the Norfolk coast at 1041, 1157, 1355 and 1555. All trains are non-stop services running via Reedham and Berney Arms. It’s likely that they will be used on additional trains, while on days that Norwich City Football Club are playing at home the LHCS set will also be pressed into traffic on the 1640 and 1806 departures from Norwich (1717 and 1847 return from Yarmouth).